OCMC's 300th Mission Team was also a first for the Mission Center. A group of volunteers served in Jamaica ministering to youth, teaching the faith, and even offering demonstrations on iconography in a country were the Orthodox Church is just beginning to emerge. Led by Fr. 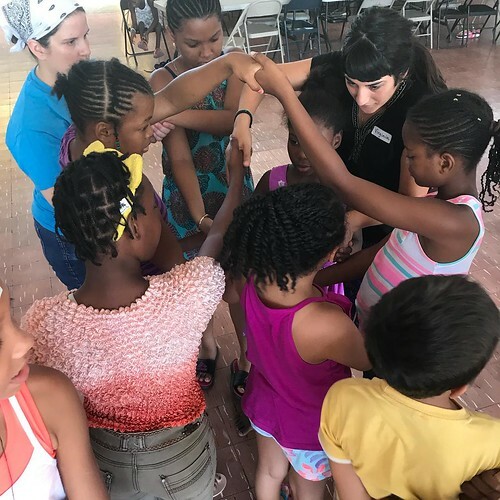 Anthony Salzman, a team of 9 volunteers set out for Jamaica earlier this month, where they spent a week doing youth work and leading discussion groups. Not only was this the very first team to go to Jamaica, but it also marked the 300th short-term Mission Team sent out by OCMC to date! This is both exciting for us at the Mission Center, and for Jamaica, where Orthodoxy is still in its early stages. The Church there has started to develop primarily through the efforts of a young man named Moses Myers, who converted to Orthodoxy in 2014. Then in 2015, the Orthodox Vicariate of Jamaica was established by Metropolitan Athenagoras of Mexico. Though they do not yet have a full-time local priest, the Orthodox faithful of the parish of St. Timothy the Apostle gather in Kingston (in a home-church in the basement of the Messias family’s house). A couple members of the team traveled out to The Hague for much of the week, while the rest of them remained in Kingston, working with Moses out of St. Timothy. They led a Vacation Bible School for about 40 young people, and they offered daily church services, which the Orthodox there do not get to witness very often. Because the Orthodox in Jamaica are so few, most of the kids that came for the VBS activities were not Orthodox, and so it proved to be a great opportunity to witness and share the Faith. Likewise the services were a good opportunity to share the Faith with adults as well, through discussion groups that took place after the services. On three different days, Fr. Anthony, who is also an experienced iconographer, even set up some canvases out in Emancipation Park, and taught people about iconography as they passed by. Overall, the team reported that their group’s diversity paid off, because everyone’s various talents were heavily utilized! They each had their own strengths, and they were all very useful in the work that they did there, in helping the Church grow. And, indeed they had the great blessing to witness the fruits of their labor firsthand, as a man named Anthony was baptized on their last day in Jamaica! Our 300th team is certainly a milestone, but there is still much work to be done. For that, we need your talents! With your help, we can look forward to the next 300 teams! If you feel called to support or participate in missions in any way, whether on a short-term trip like this one or as a long-term missionary, please visit us at www.ocmc.org for more information.